Read an interview with the author in the Dedham Transcript! 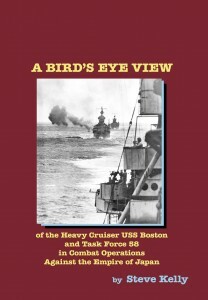 Author Steve Kelly has written a set of books about the Heavy Cruiser USS BOSTON (CA-69) in World War II. The USS Boston CA-69 was a Baltimore class heavy cruiser; it was the sixth BOSTON named by the Navy. CA-69 was launched August 26, 1942 by the Bethlehem Steel Company’s Fore River Shipyard in Quincy, Massachusetts. The ship was christened by Mrs. Maurice J Tobin, the wife of the Mayor of Boston. 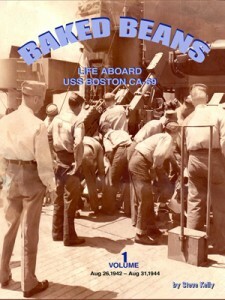 The ship was commissioned on June 30, 1943 with over 1500 sailors and officers. It reported to Pearl Harbor, Territory of Hawaii on December 6, 1943 and took part in raids, invasions and assaults of Marshall Islands, Kwajalein, Majouro, Eniwetok, the Palaus and the Western Carolines. She and her crew supported operations at Hollandia and Western New Guinea, she participated in the attack on Truk Island, and supported the invasion of Saipan. 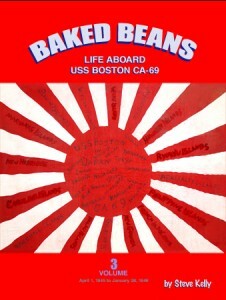 The BOSTON supported carrier task forces during the Battle of the Philippine Sea, she supported the invasion of Guam, took part in the raids on Palau-Yap-Ulithi, supported the Landings on Morotai, and the raids on the Philippine Islands. She served with Task Force 38 during the raid on Okinawa and northern Formosa as well as 4 Luzon raids. The Boston participated in the Battle of Leyte Gulf, as well as raids of Japanese positions on the Chinese mainland and raids and bombardments of the Japanese Mainland. The BOSTON helped the crippled cruiser HOUSTON, and became part of the famous ‘bait fleet’ to try to get the Japanese navy to attack a convoy of wounded ships. Finally, the BOSTON was caught up in Typhoon Cobra and listed further than was thought possible after a large set of waves. She did not sink. The BOSTON and its crew returned to the US for retrofitting March 25, 1945 after about 16 months of constant battle. She returned to Japan and was present at the Japanese surrender. The BOSTON was active after the war destroying suicide submarines and assessing bomb damage to Hiroshima. For its amazing duty the BOSTON received 10 battle stars. 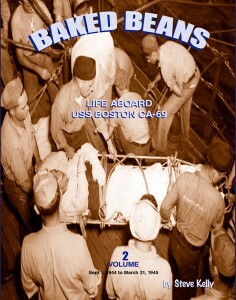 Also see our blog about the USS Boston during WWII.